Experience is the best teacher as most often say. I believe in this proverb and rely on my experience in making decisions especially concerning my family. One example is co-sleeping or bed sharing with my baby. As many call this practice unsafe, I co-sleep with my 22-month old son and plans to co-sleep with our new baby. I find co-sleeping beneficial; sharing my reasons here. 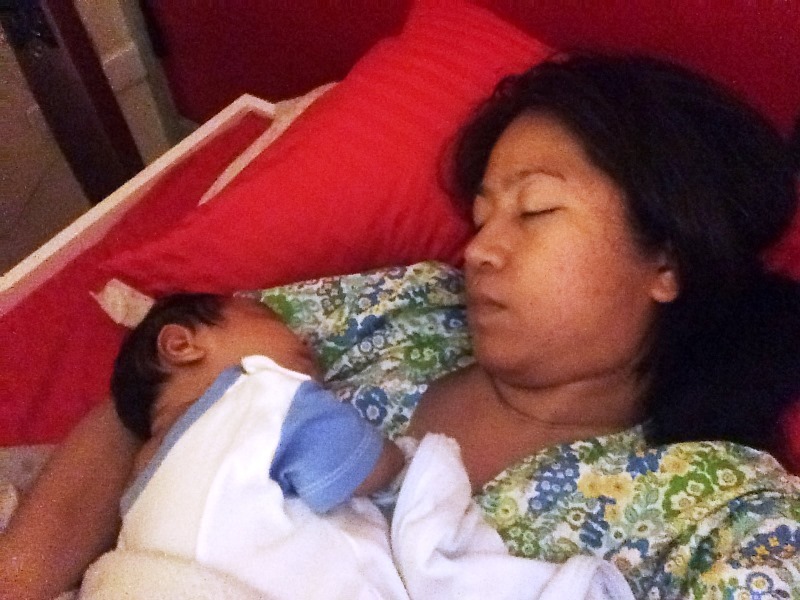 MOMI APPROVES Co-sleeping| This is my Little Man at one-month-old sharing the bed with his mama. I still breastfeed my 22-month-old son and I could always offer my breast and soothe him back to sleep whenever he needs to nurse. I, too, could have my much-needed rest and need not stand up, go to the other room, and find a place to nurse and lull the baby back to sleep. Frequent nighttime feeds also help me maintain an adequate milk supply. As breastmilk production is a supply and demand process, my son is guaranteed to have a steady milk supply given his frequent nursing. Likewise, successive breastfeeding also helps me manage those painful engorgements. Infants communicate through crying. Prolonged crying is stressful especially to a parent who would like to enjoy her sleep. It is taxing as well to the baby, and the sooner his needs are met, the more rest he could have. A mother sleeping next to her kid then could easily respond to her baby’s whimper. This gives both the infant and the other members of the family, the mother included, less stressful night. I have noticed now that my son is nearing his toddler stage, he can be really sweet and clingy. But one thing is certain, he is confident of his mama’s love and affection. He calls me with such fondness that it seems like music to my ears. Very true how John Holt, American author and educator, described it eloquently – co-sleeping is like “money in the bank,” a fund of trust, self-esteem, and inner security which the child can draw on throughout life’s challenges. Based on experience, my youngest sleeps on my arms and that way, I could easily cuddle him or give him a gentle stroking. I could also easily adjust his blanket or simply stare at him. Whereas with my three other boys who grew up in their cribs, I sometimes woke up seeing them without blankets already. Though my love for them are all the same, it is just easier to show protective behaviors to a child in close proximity. Also, nighttime cuddles are wonderful mama-baby bonding. There are perhaps a hundred more benefits of keeping baby close at night. What I have enumerated are just a few of my favorite advantages of co-sleeping. And as others may find this too selfish, but then co- sleeping also gives this mama a better rest. After all, mothers need substantial rest to have that more energy, patience, and strength to serve their family better. Not all people will agree with you but I am one of those moms who like co-sleeping. I really find it convenient and less stressful. In addition, mas tipid pa kasi kung separate room pa ang baby, additional electricity pa yun. To each his own, my youngest sister has her own room simula ng baby siya, kasi ganun sa ibang bansa. I agree, to each his own. but i super agree that co-sleeping can be real tipid. ehehhe. isang electricity na nga lang. I also did co-sleeping with all my kids when they were young as it was for my sanity. It also ensured that both were able to sleep better. They require feeding too many times a night and was too tiring to keep on moving in and out of bed just to feed them. couldn’t agree more. no more standing up and going to their beds as they are conveniently placed near their mommas. Yes, I agree. co sleeping with baby is such a convenient way to nurse them and also improve milk supply. thank you. hehe. yes, i also worried about that we i slept beside my baby for the first time. but then notice happened naman. Co-sleeping advocate as well! It adds a bond to the parent & child. I’m still co-sleeping Nate and I like it. We hug, we kiss, and since I only get to sleep at night twice a week, we also have devotion and story telling before sleeping. I think co-sleeping is wonderful! No doubt about that. Co-sleeping is convenient and the best. Nothing beats seeing your baby smiling near you or even extending parts of his body to you just to feel your skin.